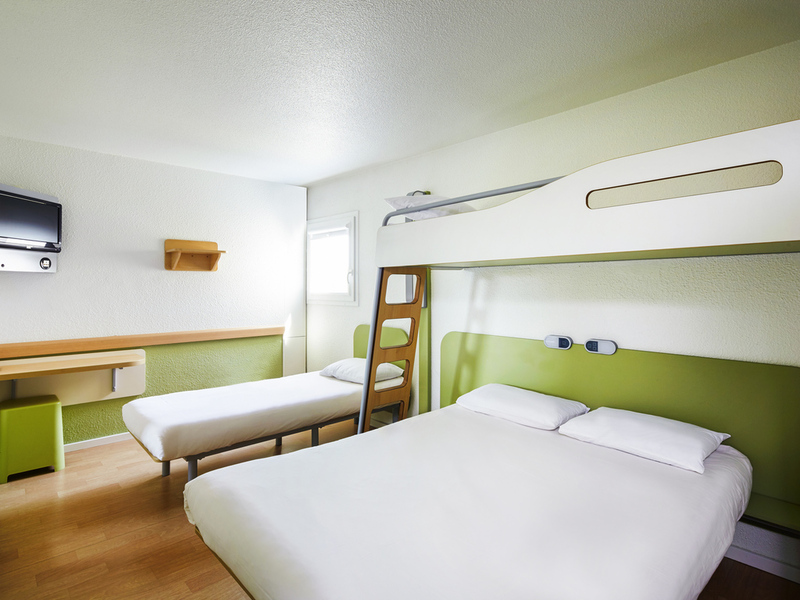 The ibis budget Chartres is located 3.7 miles from the town center. Whether traveling for business or pleasure, come and explore the cathedral and pedestrian streets, as well as the aquatic complex, exhibition center, racecourse and sports complexes. Take a break in our 2-star economy hotel in rooms for 1, 2, 3 or 4 people. All rooms have a shower/toilet, free WIFI and satellite television. Enjoy an unlimited buffet breakfast and our partner restaurants. Free enclosed car park. Open 24 hours a day. Tired and in urgent need of a refurb. Not up to the normal standard of Ibis Budget hotels. Carpet on the stairs urgently needs replacing as it is water marked and mouldy. The "key" to our room did not work on our room but on the one opposite. The blind did not stay down and had to be wedged with a loo roll cardboard tube and wet loo paper to keep it down. The bathroom smelt mouldy and the workmen on the roof started drilling at 8am. Have stayed in Ibis Budgets all over France and all of them so much better that this one. The room we were given was so small that it was impossible to get into bed without the bathroom door being closed and even the it was a tight fit. The toilet wa filthy and there was no toilet brush to clean it after use. The shower tray was filthy and needed a goo£ clean or even renewal. It was so bad that we cancelled a further visit and change£ to ibis style just along the road. Very disappointed. Stayed for one night en route to central France, I have used Ibis budget in Rouen and that one is far superior. There was a bucket on the stairs due to a leaking roof. The mattress had definitely seen better days and the shower cubicle needed testing to a bottle of bleach to kill the black and pink moulds. On a positive note the staff was friendly and the breakfast adequate before another long drive. The facilities at the hotel were fine, the reception staff were fine but two or three people in a room on the ground floor were making noise all night from 12:00 to after 5:00 when we got up and left. I understand the receptionist spoke to them a couple of times but however the noise continued through the night. When people have to drive long distances it is dangerous when they have only had a couple of hours sleep! These people should be ejected from the hotel for the safety and comfort of other people. Welcoming, clean and good value for money. Typical Ibis Budget. Well located, good price, clean and comfortable. Beds are a little hard and there really should be a kettle/mugs etc in the rooms but we all know what we’re going to get don’t we? Why is there never plug in the basin in Ibis budget hotels? The staff at Budget Chartres are exceptional. We arrived in the middle of the night exhausted with a cut on a finger. We asked for a plaster - one now and one for later, no problem. We booked into a triple room: two women and a cat - no discriminatory attitudes - no problem. In fact we looked at your assistant's cat photos. The next day we asked if we could take breakfast into the room - no problem. The room was clean and tidy - great hot shower - thank you. We parked outside in your car park - no break-ins - thank you. The coffee, croissants, nutella - all great. No frills accommodation but all amenities in working order and clean. Hotel was reasonably clean and comfortable. Maintenance wasn't perfect. Breakfast is poor, similar standard to the rest of Ibis budget Hotels. rather have it at a nearby cafe. would certainly be better value for money. Pleasant and helpful reception staff. Very good, with very helpful staff. Good hotel but too noisy from the traffic. Very difficult to find fault. Repeat visit. Just the one night travelling south. Reception was extremely friendly and helpful. Room was clean and adequate in every respect. Breakfast good as usual; and again friendly staff. Just a very pleasant little stay! A practical stop-over, but not quite the usual Ibis standard. The accomodation did have a &quot;budget&quot; feel to it - which could undermine the Ibis brand. As ever, an ex Etap hotel....but not as well refurbished as others. Major leak from toilet, a shower which flooded the bathroom, dingy decor generally.Receptionist was friendly and efficient - and breakfast (included) was fine (although a plate would be a nice touch).